Why are more Utah women choosing to give birth outside hospitals? (Francisco Kjolseth | The Salt Lake Tribune) Lyndsay Carlson of Stansbury Park plays with her daughter Eve, who is nearly 5 months old, as she describes the experience of giving birth to her at home. The family wasn't able to fill an empty birthing pool in time because she started contractions so fast. According to a new report by the Utah Department of Health, more women are choosing to give birth outside hospitals. Pregnant in 2014 with her third child, Juli Talbot was hearing a lot of “nos” from her obstetrician. Talbot wanted to try for a VBAC — vaginal birth after a cesarean section — like she’d had with her second baby. The doctor said no. “He didn’t want me to be unmedicated. He didn’t want me to have a doula,” said Talbot, of Elk Ridge. She already was annoyed with the reason for her earlier C-section: A midwife at her hospital told her she was about to have an 11-pound baby, which turned out not to be true. Feeling bossed around and unheard, Talbot — a registered nurse herself — began to investigate an option that she said initially went against her training and instincts: having her baby outside a hospital. Home births and deliveries in low-tech “birthing centers” are rising rapidly in Utah, whose rate of out-of-hospital births is among the highest in the nation. According to a report released this week by the Utah Department of Health, midwife-attended births in birthing centers more than tripled from 2000 to 2015, and home births rose by nearly 50 percent. As of 2015, 3.2 percent of Utah births were outside a hospital — more than twice the national rate, according to Heather Bertotti Sarin, quality improvement director for the department’s Utah Women and Newborns Quality Collaborative. Utah women who planned to give birth at home or in birth centers tended to be at a healthier weight before pregnancy and were less likely to smoke than women who planned hospital births, the study found. But the same women also had risks, Bertotti Sarin noted. Women were giving birth at home or in birthing centers despite having babies in breech position, carrying multiples — and, like Talbot, previous C-sections, the report said. For women who have had C-sections, subsequent vaginal births can risk tearing the scar on the uterus — a potentially life-threatening complication that deters some hospitals and doctors from recommending VBACs. Talbot found a new doctor, who was open to trying a vaginal, unmedicated birth, but who also warned Talbot that the hospital staff might not be as supportive. At seven months pregnant, Talbot worried she was facing another major surgery, based less on a thorough review of her individual needs and medical history and more on the whims of nurses and doctors who happened to be on shift when she went into labor. That suspicion wasn’t assuaged by memories of her first child’s birth, where she said she felt “pressured” by hospital staff who insisted Talbot’s pelvis shape and baby size meant there was “no way” she could have the baby without a C-section. “They jumped from zero to 10, and they didn’t give me a chance [to labor],” Talbot said. Talbot later learned the nurse had overestimated the baby’s size by almost 3 pounds — and her pelvis had not stopped her second child from being born vaginally, without complications. Another thing bothered her: Could she trust a hospital staff to even factor in the toll a C-section would take on her own health? At 22.3 percent, Utah’s C-section rate is the lowest in the country, according to the U.S. Centers for Disease Control and Prevention. But that varies wildly from hospital to hospital, according to data collected by the state. At Dixie Regional Medical Center in St. George, for example, the C-section rate was reported at less than 14 percent; at Central Valley Medical Center in Nephi, the rate was nearly 33 percent. Choosing an alternative to a hospital birth can be complicated in Utah, where the law covers a dizzying array of standards and designations for birth facilities and attendants. Talbot’s sister-in-law had had a baby in a birthing center — a business unconnected to a hospital, where births are attended by midwives in rooms typically furnished like bedrooms, with minimal medical technology. State investigators ruled that five of the nine deaths had a “strong” chance of being prevented. Utah law allows virtually anyone to practice midwifery. Unlicensed midwives have no training requirements and may take even high-risk patients, but they are forbidden from using medications or high-tech devices. At the other end of the spectrum are certified nurse midwives, who have advanced degrees and mostly work in hospitals. In between are midwives with professional certificates and state licenses. They generally are required to complete certificate programs or apprenticeships rather than academic degrees, and are restricted from certain high-risk patients. These midwives attend most of the births in Utah’s birthing centers, according to the state health department. Talbot said she interviewed midwives at several birth centers, looking specifically for those who were willing to transfer patients to physicians, and settled on a birth center that was a five-minute drive from a hospital. 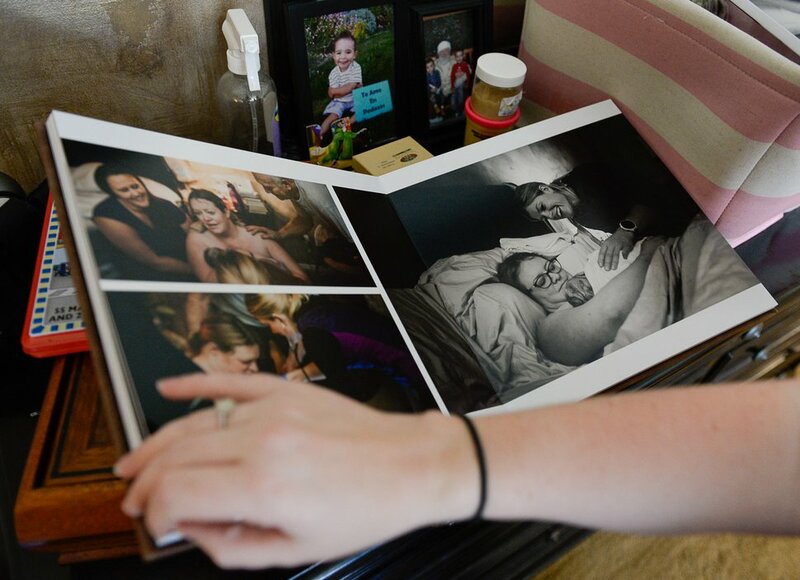 (Francisco Kjolseth | The Salt Lake Tribune) Lyndsay Carlson of Stansbury Park looks at a photo album about the delivery of her second daughter, Eve, in her bedroom last year. According to a new report by the Utah Department of Health, more women are choosing to give birth outside hospitals. “I wasn’t in distress or anything,” said Carlson, of Stansbury Park. “They said, ‘Sometimes you need an epidural to relax.’” At the hospital, doctors gave her Pitocin, which induces contractions, and her baby arrived two hours later. In December, Carlson had her second child with one of her previous midwives, this time at home. “It was nice because I wanted something more ... of my own,” Carlson said. While multiple mothers told The Salt Lake Tribune their impressions of their midwives’ professionalism helped persuade them to give birth outside a hospital, this week’s report noted one gap in care: out-of-hospital births, especially home births, were significantly less likely to include routine infant health screenings required in hospitals. Most newborns have blood drawn and their hearing and blood oxygen checked. More than 20 percent of babies born at home were not getting most of those tests. Researchers urged midwives to review the state’s screening requirements, as well as recommended state protocols for transferring laboring women and newborns to a hospital. “We acknowledge that women have the right to choose to deliver at home or in a birth center, and women are choosing this option more frequently,” said Erin Clark, a maternal-fetal medicine physician and chairwoman of the state’s out-of-hospital birth committee. Lacey Keller Smith, of Bountiful, had both of her babies at home and said she expects the practice to become more mainstream. “I have friends reach out to me to ask about my experiences: friends who have had a C-section and had to fight really hard to get a VBAC, or a doctor promised to be very VBAC-friendly and was not,” Keller Smith said. Social media in particular has allowed women to connect about birth experiences and validate each other — especially if they felt their doctors would ignore pain or trauma felt by mothers going under the knife, or write off their fears of surgery as selfish.